Redwood Hill Farm's first olive tree planting consisted of 35 trees of Tuscan olive oil varietals purchased from famed McEvoy Farms in West Marin. The mighty and beloved olive tree, known by the botanical name Olea Europaea, is prolific throughout the Mediterranean coast and is a staple of Mediterranean cuisine. The olive tree was brought to California in the late 18th century, when Spanish missionaries planted olive trees at each of the 21 missions between San Diego and Sonoma. Today, olives and olive oil are prominent ingredients in California gastronomy. Several Sonoma County farms grow and mill high quality olives and produce award-winning oils; at Redwood Hill Farm, we are growing our own. In 2008, we were able to purchase 10 acres that bordered our farm. Among other attractions, the property offered an additional farm home, a mature rose garden, a swimming pool, and room for a diverse group of farm animals. Its neglected apple orchard inspired Redwood Hill Farm owner Jennifer Bice to launch something new. With her father, Kenneth, she toured some of of the area’s local olive oil producers. Father and daughter were inspired by the diversity and excellence of local olives, and established an olive tree grove to cultivate this ancient and much-beloved Mediterranean fruit. The first olive tree planting consisted of 35 trees of Tuscan olive oil varietals purchased from the famed McEvoy Ranch in West Marin. Initially dominated by Frantaio and Leccino varietals, Pendolino and Maurino trees were also included to facilitate pollination. Our farm’s outstanding sandy loam Goldridge soil, sloping southeasterly sun exposure, along with goat manure compost, made ideal conditions for the growth of the nascent orchard. For two years, each spring we removed the tiny olive flower buds, redirecting the tree’s energy into growing strong branches. In Year Three, we allowed the olive tree buds to flower and – with the help of wind (not bees) for pollination – the trees bore fruit: our first crop. 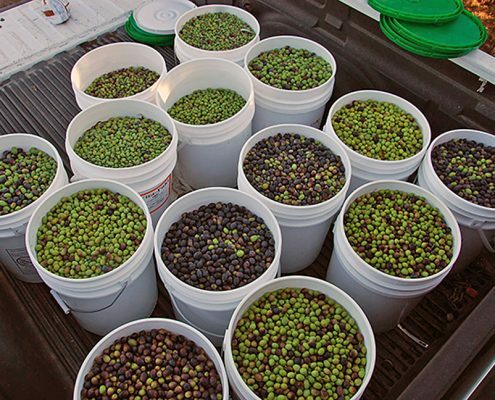 Olives are generally ready for harvest around Thanksgiving – just when our extended family arrived for the holidays. And so, a new tradition was born: the all-hands-on-deck family olive tree harvest! 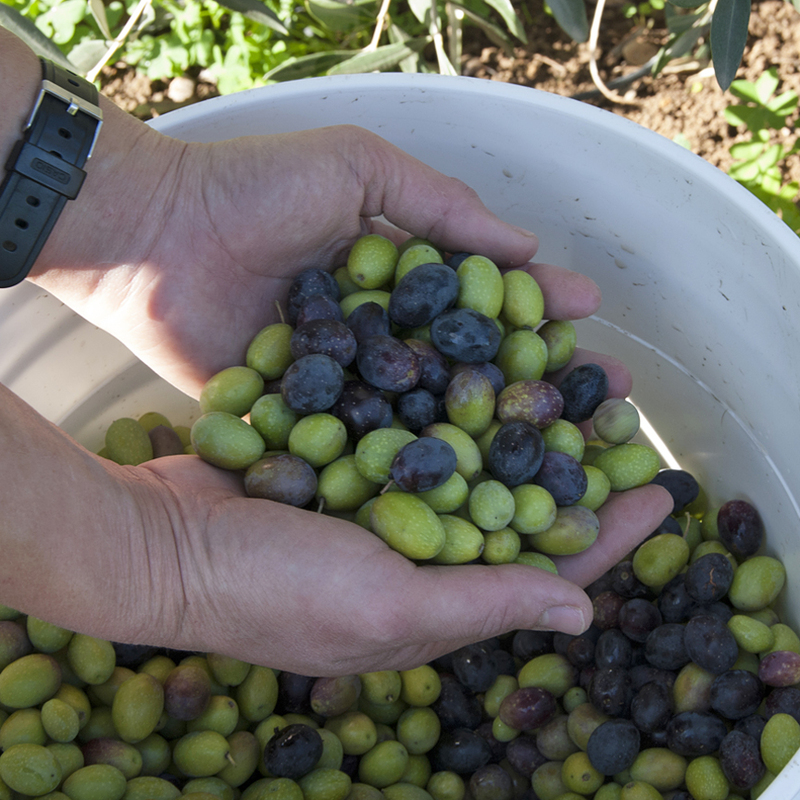 That first year, we picked 160 pounds of olives, providing enough oil to last the year in our family’s kitchens. CLICK HERE and read about that first harvest, including olive tree pictures, in our Farm Life Blog. Building on healthy growth of our original olive 35 trees, today our olive orchard includes more than 100 of them, all of which are Tuscan olive oil varieties. The 2016 harvest of our still-young trees tallied over 700 pounds: close to 15 gallons of oil. Enjoy the fruits of our labor at an olive oil tasting during one of our upcoming farm tours, DETAILS HERE. Our olives are hand-picked by family and friends, insuring that the carefully selected fruit is of optimum quality when it arrives at the mill. Rich and complex, with complementary fruity and peppery notes, it is delicious. In early November 2017 we did a first press of this seasons bounty— “Olio Nuovo”. This early pressing resulted in a delicously fresh, grassy and slightly peppery olive oil. Learn more about our Olio Nuovo here.